For many the loss of the use of legs or those who struggle with their mobility it may feel like this will create a barrier to experiencing a whole host of activities, particularly those that are based outdoors and on rough terrain. That is why 2GoAbility have the durable and sturdy wheelchair that has been especially developed for harsh terrain and use in outdoor events. The Excel All-Terrain Outdoor Self-Propelled Wheelchair can be used for a wide range of activities such as amusement parks, zoos or tourist trails. The Excel All-Terrain Outdoor Self-Propelled Wheelchair comes complete with padded armrests for comfort and a stylish nylon upholstery which is easy to clean. With its sturdy aluminium frame the Excel All-Terrain Self-Propelled Wheelchair can carry a maximum weight of over 15 stone accommodating most users and can be folded to enable easier storage and transport. 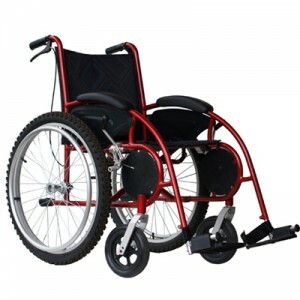 To maintain safety the Excel All-Terrain Self-Propelled Wheelchair also comes with foldable footrests which can be moved aside making it easier to step in and out of the wheelchair. The Excel All-Terrain Self-Propelled Wheelchair is provided with 22′ mountain bike tyres with an excellent grip, great manoeuvrability and amazing shock absorption. This means that this wheelchair is easy to handle and does not compromise on comfort even when tackling difficult terrains. Regardless of age the Excel All-Terrain Self-Propelled Wheelchair is great for everyone, easy to use this wheelchair can be operated independently by the users or by an attendant pushing thanks to brakes and handles attached to the back of the wheelchair.